The Calgary Flames begin their 2018-2019 home schedule on Oct. 6 against the Vancouver Canucks, two days after both teams play their season opener in Vancouver. The Stanley Cup® Champion Washington Capitals visit Calgary on Oct. 27, while the Western Conference and Pacific Division champion Vegas Golden Knights come to the Scotiabank Saddledome on Nov. 19 and March 10. The longstanding “Battle of Alberta” will continue with a visit from the Edmonton Oilers (Nov. 17) and during their season finale (April 6), while the Anaheim Ducks will visit on Feb. 22 and March 29. The Flames’ schedule will also take them to Shenzhen, China for two preseason games against the Boston Bruins (Sept. 15 and 19). Founded in 1972 as the Atlanta Flames and playing in Calgary since 1980, the Calgary Flames play in the National Hockey League. Their home arena is the Scotiabank Saddledome, which was the ice hockey venue of the 1988 Winter Olympics and currently seats 19,289. The Flames have been to the Stanley Cup Final three times (1986, 1989, and 2004), winning in 1989. This is the Flames’ first season under new head coach Bill Peters, previously the head coach for the Carolina Hurricanes. Individual and group tickets are available for all home and away games. 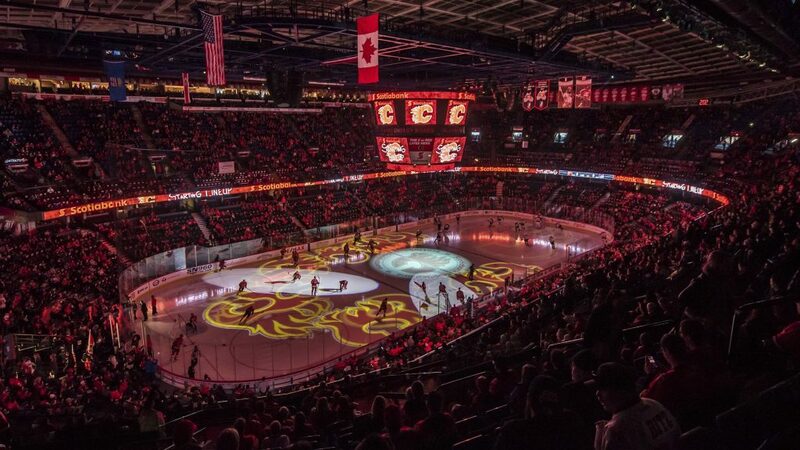 Stay up to date on the Flames all season on Twitter @NHLFlames.